Figure 3: clay tablet (left, 994.233.1) and bulla (right, 994.233.2), both bearing seal impressions. 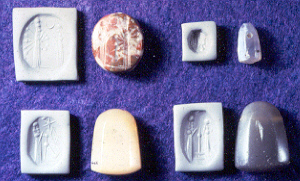 Figure 4: cylinder seals of Jemdet Nasr period, circa 3100-2900 B.C., of "marble"(top 994.233.12, bottom 994.233.11). 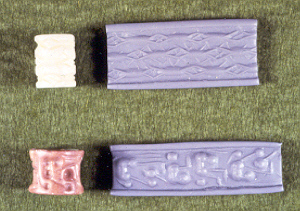 Figure 5: cylinder seals from Egypt, of "steatite" (top 994.233.49, bottom 994.233.50). Seals provide an interesting focus study, with materials and techniques changing through time. The first thing to comprehend in any understanding of the materials used is their hardness. Hardness can be measured using the Moh's scale of hardness, which runs from 1 to 10 (see Figure 1). Any rock will be made up of specific minerals of a specific hardness. In order to work a mineral or rock, it is necessary to use a material of equal, or preferably, greater hardness. One particular group of minerals that were a challenge are quartz, silicon di-oxide, with a hardness of 7 on the Moh's scale. These comprise two main divisions, the macro-crystalline types, such as rock-crystal, smoky quartz, milky quartz, citrine, amethyst and rose quartz; and the crypto- or micro-crystalline varieties collectively called chalcedony, such as agate, cornelian, tigers eye, bloodstone, jasper, and chert (including flint). Rock crystal is found as pebbles in the Tigris and Euphrates, and so are relatively available and used from an early date. Amethyst is often thought to be from Egypt, but there are also sources in Iran and Turkey. Rose quartz is also known in Mesopotamia. Amongst the chalcedonies, cornelian, bloodstone and agate was imported from India or Iran. Jasper is known along the Zagros mountains. Three main techniques were used to carve the seals.Firstly is hand working, in which the tool is held in the hand. Moorey (1994 fig. 6) illustrates fine flint tools of 3000-2600 BC from Kish which would have been used alone or mounted in wooden handles, and would have been highly suitable for working other stones. Secondly is drilling, using a bow drill in which the drill is rotated, first one way then the other by the movement of the bow backwards and forwards. The drill might be used vertically with the artisan holding the drill, or horizontally in which case the artisan holds the piece to be worked. Thirdly the piece may be ground by a rotating grinder, which even until recent times would have been rotated by a bow. In each case the tool, drill bit or grinding wheel would have to be made of a material at least as hard as the stone being worked, or be charged with grit or sand of an equal or harder material. Collon (1987 fig. 452) illustrates an impression of a seal of the Old Babylonian period which shows a piece in progress of manufacture, with preliminary work done with a wheel, then drilling, and final work by hand. Detailed examination of the technique of manufacture may be made with high-powered microscopes, or the use of the scanning electron microscope (SEM). Work at the British Museum using the SEM compared experimental work to features found on seals, all on quartz varieties. For instance experimental drillings with a hand-held flint; a copper drill loaded with emery; and a copper drill that was regularly flattened, also with emery as the grinding medium, were all compared favourably with drillings on ancient artefacts. The order of drilling out the cylinder and decorating it was not consistent. At times we find pre-made cylinders that have not yet been decorated, and occasionally we find decorated cylinders ruined in the process of drilling the hole. Casts of the drill-hole show that it was done at opposite ends. 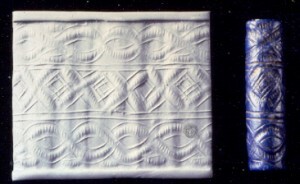 There are also occasional examples of practice pieces, experimental designs usually created on cast-off pieces of soft stone (e.g., Collon 1987 Fig 450). The agricultural revolution of the neolithic period lead to settled communities across the Middle East. Such settled communities provided unprecedented opportunities for ownership of material goods, and it was necessary to develop a system of marking who owned what. They are simple stamp-seals. 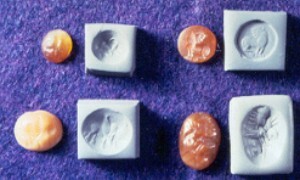 Stamp seals in the ROM collection are of a soft green stone known as chlorite, and may be dated to about 3500 BC (Figure 2). By using a harder stone, such as flint, such material is easily worked into simple linear designs. Similar designs were found impressed into clay lumps, called bullae, at the site of Nineveh, in northern Iraq. The bullae have impressions of basketry on the reverse. A stone vessel from Syria of about 5200 BC was sealed with clay and had impressions stamped on it (Fortin 1999). The continued development of the sedentary lifestyle led to greater development of trade and commerce. By about 3500 BC we start to see the first developments of recording techniques to administer this trade. These are called clay tokens, variously shaped clay nodules which are meant to represent specific commodities. They are sealed inside a clay ball, and signs depicting the commodities were cut or impressed into the exterior of the clay ball, and a seal was rolled across the surface. The great advantage of a cylinder over a stamp seal is that it covers a much larger area with one impression. A stamp will only seal as much as it can cover, but a seal can be rolled over a much larger area, indeed, may be rolled continuously to create a hypothetically infinite pattern. Soon the clay balls were replaced by clay tablets written in the Sumerian language in the cuneiform script (Figure 3). Apart from tablets and sealings for pottery vessels, baskets, sacks and even doors, there are other documents to which the seal will be used to verify. Fortin (1999) Illustrates impressions of children's feet from the site of Tell Meskene, ancient Emar, on the upper Euphrates, dated to about 1200 BC. The father was obliged to sell these children, but the owner found them to be too small and left them with the parents until they were old enough. In the meantime, he kept an imprint of each child's foot as proof of his deferred ownership, with the seals of witnesses. In the late fourth millennium BC we see a major dispersal of Sumerian material culture across the Mesopotamia region. This material culture included ceramics, notably the infamous bevelled-rim bowl, clay balls and clay tablets, and cylinder seals. This period is named after the great city of Uruk, later immortalised as the capital of Gilgamesh. Uruk cylinder seals are very large and mostly made of limestone or gypsum with some of lapis lazuli. Unlike later cylinder seals, they are not perforated through the length. The shape may have been derived from wood or bone prototypes. Evidence for use of such fugitive materials in this period is that although the most common seal type is of the "priest king" (e.g. Collon 1987 fig 807), the most common sealing is geometric (e.g. Collon 1987 fig 9), indicating that the latter seals have rotted away. The contemporary Jemdet Nasr culture produced short squat cylinders (Figure 4), and are widely distributed, being found in Egypt and Syria. Predominantly soft dark stones like chlorite are used, or calcite, mostly worked with a drill. Very occasionally we find harder ones, like rock crystal. This may have been worked using emery, the aluminium oxide mineral corundum. It was apparently found at the excavations at Ur, and is known from Sumerian texts, where it is referred to as being mounted in lead. Emery may have come from the Island of Naxos or from India, although sources are also known in the upper Euphrates. Common subjects include people working and walking animals. Towards the end of the 4th millennium BC cylinder seals become simple with wheel-cut designs and are very widespread, being found from Egypt to Iran. The end of the fourth millennium roughly coincides with the beginning of the Early Bronze Age. As its name suggests, the period may be misleadingly defined by the use of bronze, the copper-tin alloy, as in fact the chief alloy of the time was an arsenical copper. During this period trade in the valuable commodities of copper and later tin becomes essential, as they are uncommon materials. This trade, and other forms of exchange, become controlled by the ruling elite. Hence the material culture of this period is often defined by the ruling elite, from the pyramids of Egypt, the cyclopean architecture of Greece, and the megalithic monuments of Europe. A complex bureaucracy develops to maintain this control, in Mesopotamia using the complex cuneiform script on clay tablets and marking ownership by the use of cylinder seals. Hence the Bronze Age becomes a golden age for cylinder seals. The influence of Mesopotamian culture can be illustrated by cylinder seals from Egypt dated to about 3100 to 2686 BC (Figure 5). Some of the earliest seals of the third millennium are made of a very soft material, talc, the hydrous magnesium silicate, often commonly referred to as steatite, which is actually soft enough to be worked by fingernails. Long thin wheel-cut geometric cylinder seals (e.g., Collon 1987 fig 41) from northern Mesopotamia are made of this soft stone, and then fired to enstatite, the anhydrous magnesium silicate. A similar piece in the ROM collection (Figure 6) from Sumeria is in lapis lazuli. After about 2750 BC lapis lazuli is found in large quantities in Mesopotamia. This is the Early Dynastic period of Sumeria, the time of the Royal Tombs of Ur, in which objects of lapis figure prominently. Lapis had such significance that it assumed a metaphorical role in literature, being synonymous with wealth and gleaming splendour, and it was an attribute of gods and heroes. Although there are smaller sources in Iran, it is generally thought that most lapis was imported from Badakhshan in Afghanistan. Lapis is actually a rock, rather than a mineral. It is really marble, the metamorphosed limestone mostly made of the calcium carbonate mineral calcite. The blue colour is from the mineral lazulite, a hydrous magnesium aluminium silicate. Lapis lazuli therefore comprises calcite and lazulite, often with other minerals such as the iron sulphide, pyrite. Fortin (1999 fig ?) Publishes an unworked piece found at Tell Mardikh, ancient Ebla, near Aleppo in Syria, in a context dated to 2300 BC. Lapis was often traded in this raw state. 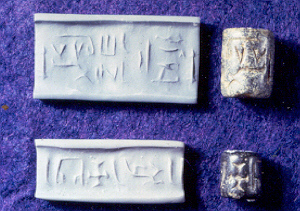 Figural seals from Sumeria form two main subjects: contest themes and banquet scenes. Contests change from early horizontal combatants (e.g. Collon 1987 fig. 61) to later vertical combatants (e.g. Collon 1987 fig. 522). From c. 2600 BC we have a well-dated sequence of Royal seals, such as one of Mes-ane-pada, first king of the First Dynasty of Ur (e.g. Collon 1987 fig. 522). 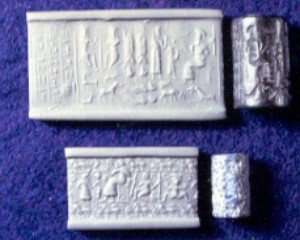 The second group of Sumerian cylinder seals is of banquet scenes (e.g. Collon 1987 fig. 93). The Akkadian period, from about 2334 to 2193 BC, saw the first major Semitic culture in Mesopotamia. It was founded by Sargon of Akkad, a city thought to be in the vicinity of later Babylon. Sargon and his successors, such as his grandson Naram-Sin, created an empire that extended from the coast of the Mediterranean to the Persian gulf. Akkadian seals are usually large concave- sided cylinders, and have two main themes. Contest themes continue, with deeply cut musculature and less cluttered (Figure 7). The banquet scene is largely replaced by the presentation scene with astral deities of Semitic Akkadians figuring prominently (Figure 8). The predominant material is serpentine, a dark metamorphic rock formed from the oceanic crust and thrust up into Iran and Turkey during the creation of the Zagros and Taurus mountains. Other seals are of poor-quality lapis, greenstone, diorite, cores of large shells, green and red jasper, and rock crystal. In the Ur III period, between 2192 and 2004 BC chlorite becomes the overwhelmingly dominant material. It is slightly harder than serpentine, and also comes from Iran and Turkey. Combat scenes continue, but predominant is a highly standardised presentation scene, with the deity facing left and Lama, the intervening goddess, presenting worshipper. Towards the end of 3rd millennium hematite, the iron oxide, is introduced, and overwhelmingly dominates cylinder seals for the first four centuries of 2nd millennium (i.e. c. 2000-1600 BC), which is also the beginning of the Middle Bronze Age. Hematite is a hard, heavy, dense mineral, and takes carving well. The main sources are in the volcanic regions of eastern Turkey, although chemical analysis has revealed at least five separate groups. Other materials include rock crystal, smoky quartz, amethyst, obsidian, red and white jasper, cornelian from India, and amazonite, a blue feldspar from Kashmir or the Urals. This is the period of the Old Assyrian Empire, nowadays more often thought of as a trade zone covering the resource-rich areas of eastern Anatolia, the source of hematite (Figure 9). In southern Mesopotamia this is known as the Isin-Larsa period. Presentation scenes now have a hat on the worshipper, and so-called "space-filling" objects, while the goddess Lama typically now has two hands up (Figure 10, see also Collon 1987 fig. 153, Collon 1987 fig. 538). In 1763 BC Hammurabi unites central and southern Mesopotamia and founds the Old Babylonian empire. Perhaps the most famous monument of his period, that black stelae carrying his law code, is decorated by a presentation scene. The Old Babylonian period heralds a return to Early Dynastic and Akkadian contest scenes, (Collon 1987 fig. 158) and contests with deities (Collon 1987 fig. 165). The presentation scene changes to goddess Lama and king with beard, and Lama actually facing the king (Collon 1987 figs. 1, 166, 167). After the death of Hammurabi in 1750 BC seals commonly have unmasked drilling and wheel-grinding (Collon 1987 fig. 193). In the western area of greater Mesopotamia we have the wealthy and powerful of kingdom of Yamhad (Aleppo). 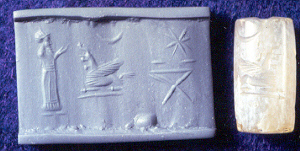 Cylinder seals in this region are often influential on later styles, particularly guilloche motifs and ways of presenting the chief deity (Collon 1987 fig. 209, 219). In the east, in the Elamite regions of Iran, cylinders were made of bitumen (Collon 1987 fig. 225). In Hittite Anatolia, seals would would be cylindrical, but not drilled down the centre, and have a stamp seal at the bottom (Collon 1987 fig. 841; 835). Around 1500 we have another dark age in ancient history, marking the beginning of the Late Bronze Age. Seals in this period are primarily made of hard stones of the quartz group. These include coarsely crystalline quartz varieties, such as clear rock crystal, and microcrystalline varieties such as grey chalcedony and agate. In Mesopotamia we have two main cultural areas. In Babylon are the Kassites to 1155 BC, two main styles with abundant inscriptions, usually a long prayer (Figure 11, see also Collon 1987 fig. 239; 240). In northern Mesopotamia and Syria are the Mitanni. Here we have a new material introduced: sintered quartz or faience (Figure 12). Cut seals are an amalgam of old styles. 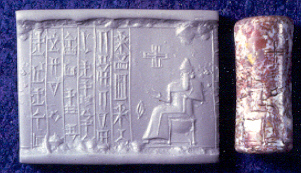 For instance King Idrimi of Alalakh, Syria, in c. 1500 has a Babylonian goddess with a Syrian guilloche (Collon 1987 fig. 546). In the 14th-13th centuries we see the growth of the Middle Assyrian Empire. 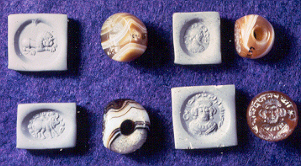 Hard stones comprise about 80% of Middle Assyrian seals, and none are of faience. 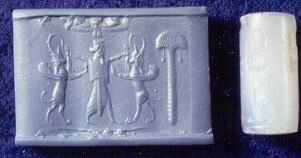 Cylinder seals are made taking full advantage of the continuous relief effect that they provide, for instance a continuous line of animals (e.g., Collon 1987 fig. 279; 282). In 1000 we have the beginning of the Iron Age , a new world of more easily acquired metals. Government- organised trade and elite bureaucracies will become a thing of the past. In the 9th century BC we see the growth of the Neo-Assyrian empire - earlier soft serpentines and limestone and later quartz seals are generally taller and narrower with barrel-shape and convex ends (e.g., Collon 1987 fig. 340). Hunting and feasting are common subjects, some can be related to to wall-reliefs of mid-8th century (e.g., Collon 1987 fig. 656). At end of 8th century growing use of writing in alphabet rather than cuneiform on materials other than clay led to increasing use of stamp seals. In 612 Assyria falls to Medes from Iran and Babylonians. Seals of the neo-Babylonian empire continue cylinders, almost entirely using hard stones (Figure 13), but there is increasing use of stamp seals (Figure 14). In 539 BC Cyrus the Great captures Babylon and in the 5th century the Achaemenid empire stretches from the Nile to the Indus. The royal archives are recorded using cuneiform on clay tablets and sealed with cylinder seals, so we see a revival of cylinder seals. 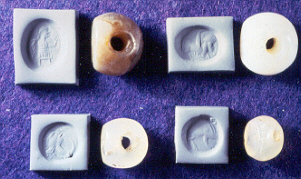 The Achaemenids quickly develop a new style of cylinder seal on barrel-shaped agates and chalcedony (Figure 15). By the end of the 5th century cylinder seals are obsolete. Under the Seleucids the chief type of seal appears to be used in signet rings, and is in hard stones such as carnelian (Figure 16). Under the Parthians and later the Sasanians distinctive types of stamp-seals are developed (Figures 17 and 18). 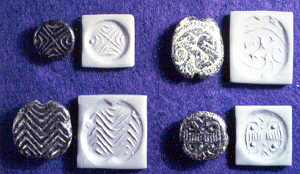 These appear to be the last of a uniquely middle- or Near-Eastern seal type, however, as later seals of the medieval or Islamic period are of the signet type. Collon, D. 1987, First Impressions: Cylinder Seals in the Ancient Near East, University of Chicago Press. Fortin, M., Syria, Land of Civilizations, Les Editions de l'Homme. Moorey, P.R.S., 1994, Ancient Mesopotamian Materials and Industries: The Archaeological Evidence, Clarendon Press, Oxford.